A Lewis & Clark and Southridge High grad studied the microloan industry in Cambodia. Lacey Jacoby’s world was rocked when she took a sociology class at Southridge High School. Fast-forward four years, and Jacoby is a recent graduate of Lewis & Clark College, with a double major in biology and a combined sociology-anthropology program. 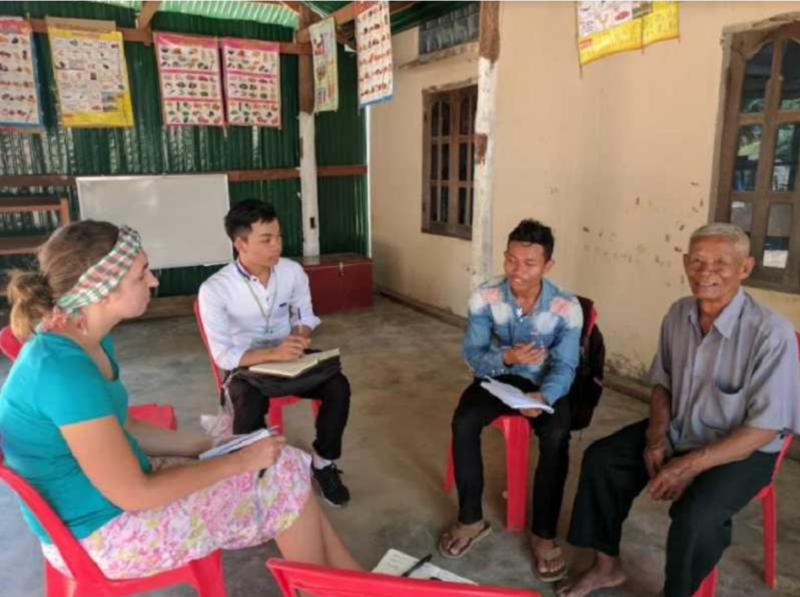 And she put her skills to the test this autumn, when Jacoby traveled with a professor and two peers to Cambodia, to learn about the country’s microcredit loan industry. Titled “Loans That Change Lives: Interrogating Microcredit in Cambodia,” and organized by Lewis & Clark Assistant Professor of Sociology Maryann Bylander, the project delved into how microloans — defined as a small sum of money lent at a low interest to a new business — are abused by lenders in Cambodia. Bylander, Jacoby and her two classmates spent about three weeks in the country in September and October, interviewing microcredit lenders, partnering organizations, borrowers and others affected by the industry. Our professor, Maryann, was the only one who went in with any sort of background in microcredit. We all were coming from different places, but it made sense to start there. … It was a good learning experience, because going into it I didn't know hardly anything about microcredit. Microloans are intended to be small amounts of money, and to go toward funding new businesses to strengthen the local economy. Westerners may be familiar with microloan websites like Kiva, which allow users to invest their money in entrepreneurs in developing countries, and have a decidedly philanthropic bent. However, Jacoby and her fellow researchers found that in Cambodia, those loans can easily equal thousands of U.S. dollars, and that borrowers use them for everything from covering medical expenses to paying back their other debts. Jacoby compared the way Cambodians use microfinancing to the way Westerners might use a line of credit from a bank — and noted that the interest rates can be just as high. The country recently put a regulatory cap of 18 percent interest rates on all microloans, but many microfinance institutions — run by locals but funded by Western investors — simply increased their fees to make up the difference. Jacoby met one Cambodian woman who took out a microloan with the intention of building a pond where people could pay to fish. Then her husband died, and she was unable to build the business herself. Shortly after that, she lost money that her friends had given to her to exchange for them, and had to take out another microloan to pay them back. When a man in her village lacked a home title to use as collateral, the woman cosigned yet another loan with him — and then he stopped making payments, so she had to take responsibility for a third loan. Interviewing borrowers who were deeply indebted made Jacoby question whether microloans could ever be effective in Cambodia. And she said that they key to helping the country’s economy may lie in fixing the healthcare system. Now that Jacoby’s graduated from Lewis & Clark, she plans to work in the public health sector for a few years, then pursue a master’s degree or Ph.D. in public health. The Cambodia project was her third chance to travel abroad through Lewis & Clark, and she said the experience is invaluable. We all worked together on budgeting, and we all worked together on finding people to interview. Moving forward into a research position, it's so, so helpful to have that experience, especially in an international environment.